This class exposes both the interface to the call graph container and the module pass which runs over a module of IR and produces the call graph. The call graph interface is entirelly a wrapper around a CallGraph object which is stored internally for each module. Definition at line 324 of file CallGraph.h. Definition at line 339 of file CallGraph.h. Definition at line 338 of file CallGraph.h. Definition at line 260 of file CallGraph.cpp. References llvm::PassRegistry::getPassRegistry(), llvm::initializeCallGraphWrapperPassPass(), and ~CallGraphWrapperPass(). Definition at line 344 of file CallGraph.h. Definition at line 346 of file CallGraph.h. Definition at line 295 of file CallGraph.cpp. References llvm::AnalysisUsage::addRequiredTransitive(), llvm::dbgs(), llvm::errs(), getAnalysisUsage(), llvm::PassRegistry::getPassRegistry(), ID, INITIALIZE_PASS_BEGIN(), INITIALIZE_PASS_DEPENDENCY, llvm::initializeCallGraphPrinterLegacyPassPass(), llvm::ModulePass::ModulePass(), print(), runOnModule(), and llvm::AnalysisUsage::setPreservesAll(). Definition at line 345 of file CallGraph.h. Definition at line 347 of file CallGraph.h. Definition at line 266 of file CallGraph.cpp. Definition at line 335 of file CallGraph.h. 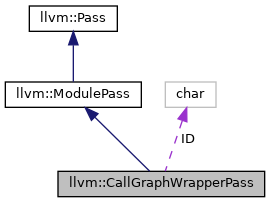 Referenced by llvm::AnalysisCallGraphWrapperPassTraits::getGraph(), and llvm::InternalizePass::run(). Definition at line 336 of file CallGraph.h. Definition at line 363 of file CallGraph.h. Definition at line 359 of file CallGraph.h. Definition at line 342 of file CallGraph.h. Definition at line 384 of file CallGraph.h. Definition at line 350 of file CallGraph.h. Definition at line 355 of file CallGraph.h. Definition at line 283 of file CallGraph.cpp. Definition at line 378 of file CallGraph.h. Definition at line 270 of file CallGraph.cpp. References ID, INITIALIZE_PASS, and releaseMemory(). Definition at line 328 of file CallGraph.h. Referenced by dump(), and runOnModule().